Today, nearly 22 million people living with HIV have access to life-saving medication. AIDS-related deaths have been cut in half in over a decade and the number of babies born each day with HIV has declined by two-thirds in the same timeframe. Medication is a key piece of winning this fight, but it’s not the only piece. (RED)-funded grants support a diverse range of lifesaving HIV/AIDS programs, including prevention, testing, counseling, and treatment services, sexual reproductive health education, peer mentorship programs and much more. (RED) Supported GRANTS HAVE IMPACTED More than 140 MILLION LIVES. Rise Clubs provide much needed safe spaces for women and girls to share and discuss difficult issues, and build resilience among peers. First founded as a response to the high rates of HIV infection among teenage girls and young women in South Africa, Rise Clubs link young women with essential services such as HIV testing and counseling, antiretroviral therapy, sexual reproductive health services, and educational and economic opportunities. These clubs provide a space for young women to support each other in navigating the social and cultural challenges that can contribute to risky sexual behavior. Aprofaper is an NGO promoting economic development, health education, and legal aid to people living with HIV, while also working to stop stigma in the broader community. Josephine is a member of Aprofaper’s Mukamira Farming Cooperative. Before Aprofaper was present in the community, people living with HIV were stigmatized, leaving them isolated and unable to work. Thanks to the introduction of community education and health services, as well as economic empowerment opportunities, such as farming and animal husbandry classes, HIV+ people living in Mukamira are not only healthy and thriving, but also earning an income and supporting their families. Nana is a senior nursing officer at Adabraka Clinic in Ghana. At Adabraka, Nana runs a pregnancy class for expectant mothers and fathers, providing education on maternal and newborn child health, as well as ensuring all parents are tested for HIV. If found HIV-positive, Nana and the rest of Adabraka’s stellar nursing team provide support to the expectant mothers to keep them healthy and ensure their babies are born HIV free. Connie has been through more than one person ever should. Before she discovered she had HIV, Connie had three children. During her pregnancies, Connie unknowingly passed the virus on to her children, and later lost them all to AIDS-related illnesses. Despite this devastating loss, Connie has persevered, and with the help of ARVs, she has stayed healthy, counseled women just like her, and in 2012, gave birth to a beautiful HIV–free daughter, named Lubona. Kimisagara Youth Center in Kigali is a one stop shop for adolescents and young adults. The Center provides life-changing services such as IT education, vocational training and career counseling, as well as sports and arts programs. While at the center for these life skills programs, youth can also access sexual reproductive health services and counseling in an accessible, youth-friendly environment. Peer educators from the Center also work to educate the broader youth community —through interactive theater and sports programming—with essential knowledge on how to protect oneself from HIV. 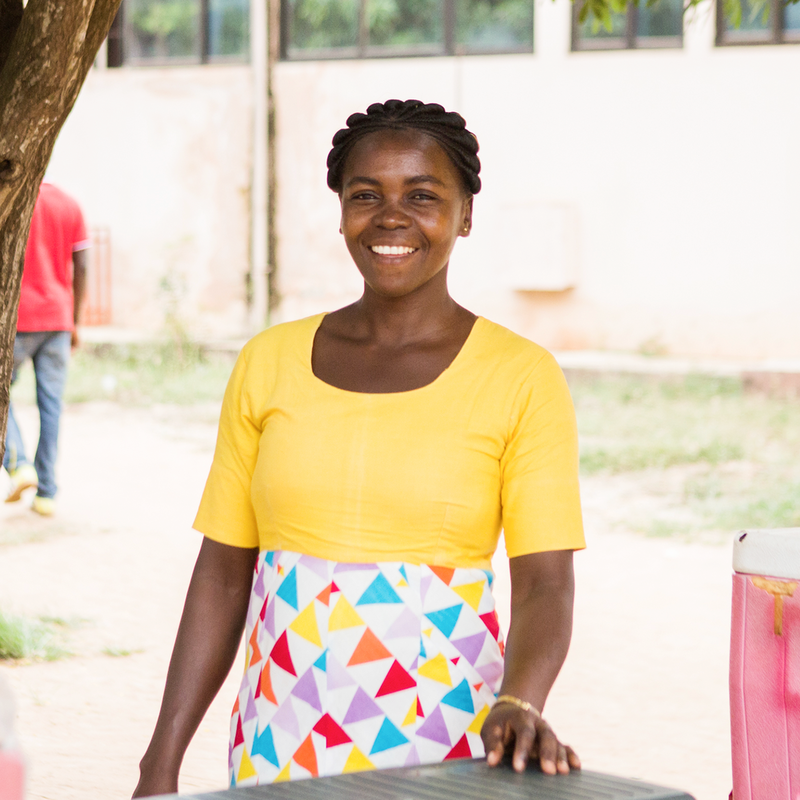 Ruth Oman works at a local food and drink kiosk in Tema, Ghana. When Ruth first found out she was HIV-positive, she feared the reaction of her friends and family. Thanks to the incredible care and support provided by the Tema Hospital staff, Ruth has stayed alive and healthy. She met her husband Abraham at an HIV support group, and today, the couple are the parents of five HIV-negative children. In her spare time, Ruth also serves as a health advocate in her community, encouraging other people to speak out about their HIV status and seek out treatment and testing services. "WHERE YOU LIVE SHOULDN'T DETERMINE WHETHER YOU LIVE."